Ian Mackenzie is the marketing director of Toronto’s Praxis Theatre, and has been a trailblazer in the theatre corner of the blogoshpere for over 2 years at the Praxis blog Theatre is Territory. And I love a good bubbling anger. Anger is so good. good stuff, although #2 makes me look back to #9. Do you mean that there are lots of people working in the theatre who aren’t pulling their weight? Writers write, right? Maybe email and txt msgs don’t count, or maybe they do – and we are a civilization of letters. Good catch! You’re right. Paradox or just plain contradiction? 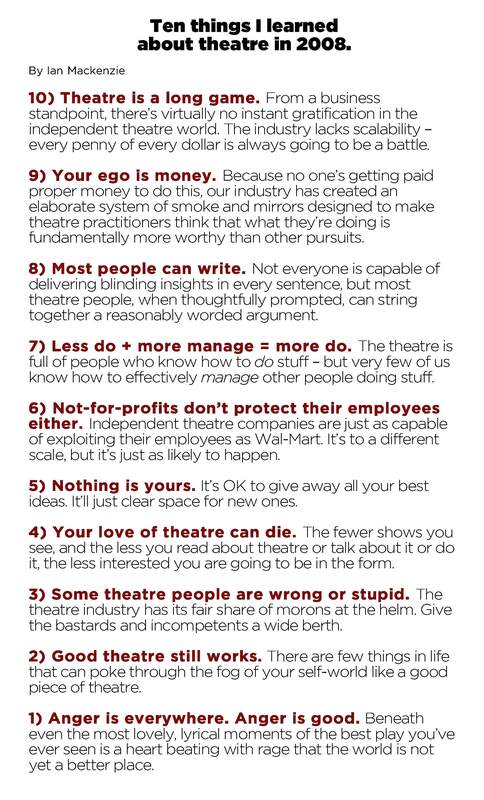 To be honest, I think I added that point because I knew I had to say something nice about theatre at #2, but I wasn’t sure how to say something nice that was also insightful . . . I think that is the general rule for most organizations. You look at my board and yep 20% do the slog and the other 80% show up. And I think that we have a good board in fact. Most indies have a group of people who make up the company but usually 100% are there for the artsy stuff and 20% are there for the admin/clean up/ crappy stuff. In fact when people ask me how or what they should do to start there own company I tell them to get a dolly since they will be doing most of the heavy lifting. I like your style Philip. You know what, I do think emails count. And maybe it makes my point even more – the emails I get are rather atrocious at times. It particularly pains me when someone is submitting a play and there is no punctuation or even a complete sentences in their email cover letter. I do agree that we are a civilization of letters. Even more so now as we Twitter and txt and blog and so on. I love it so.